KATHMANDU, June 30: Stocks came under pressure throughout the week as the Nepal Stock Exchange (Nepse) index finished nearly 20 points lower compared to the past week. The benchmark index shed values in most of the trading days and posted modest gains in only two out of five trading days. 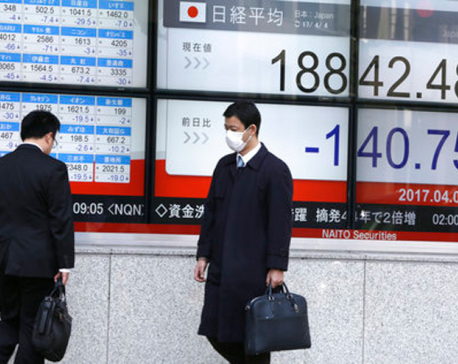 Eventually, the index ended the week at 1,198.54 points. Sensitive Index which measures performance of Class 'A' companies listed on the secondary market also dropped 3.66 points to close at 252.09 points on Thursday. Daily transactions remained below Rs 250 million in all trading days. 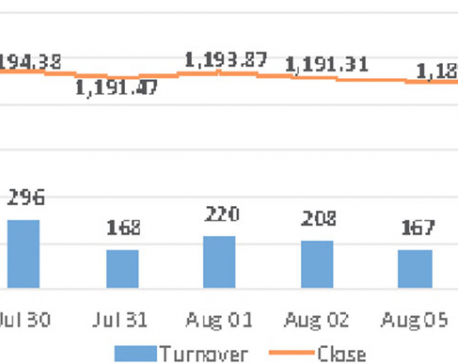 Consequently, the exchange experienced the year's worst week in terms of activity as a turnover of just over Rs 1,041 million was recorded this week -- a decline of 7.25 percent compared to a week earlier. All major sub-indices followed the broader market and ended in red. Trading Sub-index was the only exception, finishing the week flat. Significant weakness was visible in Manufacturing and Processing stocks reflected by a slump of 3.12 percent in its sub-index. Microfinance, Hydropower and Insurance companies were also under pressure as their sub-indices declined over 2.5 percent each week-on-week. Banking stocks dominated the list of companies in terms of turnover led by Mega Bank Ltd as Rs 41 million worth of the bank's shares were traded in the week. The bank recently announced 10.75 percent bonus shares to its shareholders. Next on the list was Nepal Investment Bank Ltd which logged transaction of more than Rs 30 million. Standard Chartered Bank Ltd, Nabil Bank Ltd Promoter Share and Everest Bank Ltd were next on the list in terms of turnover. A total of over four million units of shares were listed for trading on the exchange. The listing includes over 65,000 bonus shares of Nepal Lube Oil Ltd and more than four million units of right shares of Nirdhan Utthan Laghubitta Bittiya Sanstha Ltd.
On news, Nadep Laghubitta Bittiya Sanstha Ltd concluded its IPO of 480,000 units of shares this week. After the issue, which was oversubscribed by almost 24 times, the microfinance's paid-up capital will reach Rs 160 million. In the meantime, Nepse has received bids from two companies for carrying out user acceptance testing (UAT) of the fully automated trading system. The test will be carried out for about two months. Thereafter, the platform can be expected to be accessible to general public. The technical analysis of ARKS shows that the market has prolonged its bearish momentum with the index adding up weekly losses. The market has dropped to the psychological level of 1,200 points and is currently testing that line. Index movement during early next week can point out a likely course for the equity market in the near term, given the move is backed by significant volume.